Crime Watch: YA novel PIG BOY scoops Ned Kelly Award! YA novel PIG BOY scoops Ned Kelly Award! Last night, at an event that was part of the Melbourne Writers Festival, the 2012 Ned Kelly Award winners were announced (hat tip to Omnimystery News for the results list). The book that has scaled the mountain of Australian crime fiction to emerge victorious at the summit is PIG BOY by JC Burke (the other finalists were CHELSEA MANSIONS by previous winner Barry Maitland and THE LIFE by Malcolm Knox). To be honest, prior to the Ned Kelly Awards, I had never heard of either this book or its author. I imagine many of you may have also been 'in the same boat', so to speak. But clearly it has something that the judges liked, so I thought I'd do a little digging, to bring you all a bit more information. Damon has been teased, harassed and bullied as long as he can remember. He's smart, and he's fat, and he can't shut up; he's just too different for a little town like Strathven. Of course, he might not have helped things with the whole incident at Year 10 camp – that was when the fear started, and the nickname became “psycho.” Now it's his eighteenth birthday, and Damon has just been expelled for threatening a teacher. All he has now are his first person shooters, his lists of names, and that black bag in his wardrobe he refuses to think about. He's convinced the town's biggest bullies are coming for him, and he has nowhere to to turn until he hears of a job with the town's other outcast, the Yugoslavian war veteran and hunter simply known as Pigman. Not your typical detective novel, then. In fact, Random House Australia has the book listed under "General Fiction (Children's/Teenage), so perhaps an intriguing choice by the Ned Kelly Awards judges. Having not read the book, I can't vouch for the amount of crime or mystery in it, but certainly the blurb hints that some violence, and perhaps thrills, are on the agenda. Read that full 10-question interview here. In the past year or two I've read and really enjoyed some young adult crime/thriller fiction, such as the excellent books LETHAL DELIVERIES by Ken Benn and SMILING JACK by Ken Catran, so the ideas behind PIG BOY and the issues it seems to address is quite intriguing. I may have to get my hands on a copy (and add it to the ever-growing TBR mountain). 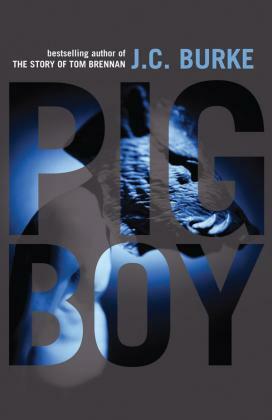 Have you read PIG BOY, or any of JC Burke's other young adult novels? What do you think? Do you enjoy occasionally (or often) reading young adult fiction, even as an adult? Can young adult books address different issues, or address issues in a different way, than their adult counterparts? Comments welcome.